Across the nation, labs are facing the toughest financial squeeze of recent times. Simply said, lab managers are being asked to cut operating costs and operate their labs with smaller budgets during 2016 – and beyond. That makes it essential for savvy lab managers to stay current with the most effective techniques for cutting lab costs and managing shrinking lab budgets. While the mission of the lab will always be to provide the highest quality patient care, the environment within which the lab operates is undergoing rapid regulatory and technological change. These include changes to reimbursement, test utilization based on patient outcomes, and new competition from non-traditional sources. All of these present new challenges to traditional budget planning. Strategies for adjusting the lab operation to stay within your present and future budgets must not only include cutting costs, but maintaining quality. In this blog post, we’ll examine 3 ways adopting a LIMS system can help your lab cut costs while improving efficiencies – all while ensuring patient care remains top priority. Lab data can be integrated into many electronic medical records that provide “summary reports” and “trends” to visualize patient data. However, these generic reports are not sufficient to manage complex tests or reporting that advanced labs increasingly require. While there are many ways to improve output for physicians and increase the value a lab can provide, one way to immediately impact value while improving efficiency is to streamline reporting and increase the number of tests and case types that a lab’s reporting software can handle. Advanced labs need the ability to adapt to changing technology and provide interpretive reporting across existing and emerging tests. Platforms like Pathagility – which can serve as a lab’s LIMS or Interpretive Reporting Software – or both, can dramatically increase the output while simplifying reporting. Labs need to deliver reports and lab tests electronically, reliably, and efficiently to referring physicians or clients, all in a timely and affordable manner. Delivering in a competitive market is essential – especially when the patient’s well being is at stake. In addition, labs need to gain the agility and control to deliver critical information on their terms and time schedule, connecting any device, software, and people – whether physicians, lab staff, or patient – with no barriers. Advanced labs are running their business in the cloud, with platforms that integrate across all technologies, reducing manual work and labor that can be costly and time consuming. Today’s advanced labs need a platform that can easily integrate with their existing systems and interpret data from existing EMRs, LIMS, billing systems, lab instrumentation, and middleware systems; while affording them flexibility to report through multiple channels. Innovative labs are committed to leveraging new technology to help their teams work smarter, faster, and communicate better – both for the benefit of the lab, as well as the patient experience. These labs need complete visibility and improved communication across their workflows and processes, which inevitably improve turnaround time. Labs currently using multiple systems independently should consider consolidating technologies to allow for greater efficiency and communication across all lab technology. Platforms like Pathagility can be set-up as a stand-alone LIMS or work in conjunction with existing systems to make all data visible in one location. To learn more about how Pathagility can help your lab can keep up with the changing technology landscape, request a 30-minute demo. So many changes have happened in the past decade – just imagine how many more changes will come in the next 10 years? Today, PGx labs are developing impressive new tests to save lives and prevent illnesses, but they need to be more efficient, more organized, more knowledgeable, and more competitive than ever before to ensure their labs are positioned for continued success. Most PGx labs are equipped with state of the art instrumentation including multiple, next generation DNA sequencing instruments, drug lexicon databases, and intelligence systems to provide a personalized blueprint specific to the patient, and more. While PGx labs use top of the line lab instruments and intelligence systems for their complex testing needs, it’s equally important for labs to ensure their reporting software or LIMS is up for the challenge, so that lab executives can properly and efficiently inform referring physicians or groups about the findings, in an intuitive and easy-to-understand format. PGX lab executives need a central laboratory reporting solution (LIMS) that will adapt across any type of test, device or laboratory to provide their lab, referring physicians and patients with the enhanced reporting that modern labs now require. In addition, today’s advanced labs need a platform that can easily integrate with their existing systems and interpret data from existing EMRs, LIMS, billing systems, lab instrumentation, and middleware systems; while affording them flexibility to report through multiple channels. One Pathagility client specializes in PGx and toxicology testing, and does approximately 200 PGx tests per day. With testing so sophisticated and unique, the lab needed a better way to provide clean and easy to interpret reports to referring physicians or groups that could be customized by case types, as well as branded to specific groups. The former, in-house, LIMS system that the lab used,, was not able to adapt to their growing testing capabilities and, as a result, couldn’t meet the lab’s needs. The lab’s former in-house system was only able to analyze 50 tests across toxicology and PGx. With Pathagility, the lab is now able to analyze over 95 different tests – with the ability to analyze even more as the lab continues to expand testing. 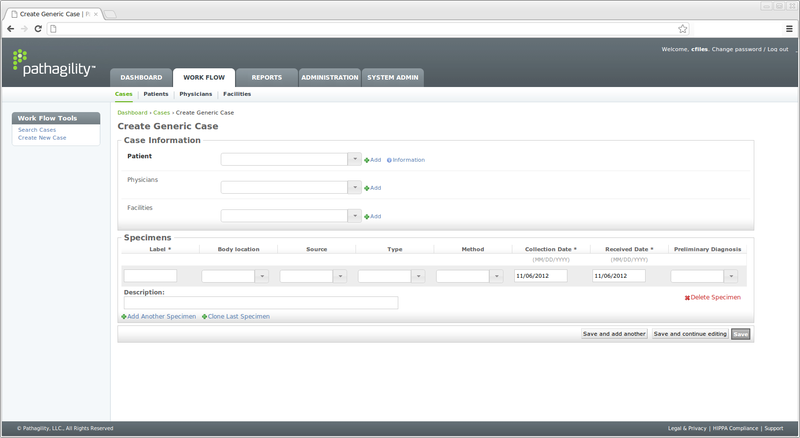 The team is now able to format reports by any number of factors, including case types. Previously providing two separate reports to referring physicians and groups, Pathagility now allows the lab to create just one easy to interpret visual report. In addition, the team can now work alongside marketing to rapidly integrate unique logos and design for each group it serves, to reinforce their branding. How is your PGx lab prepared to keep up with the changing landscape? Does your current technology allow your lab to meet your needs, without adding manual work? To learn more about how Pathagility can help your PGx lab can keep up with the changing technology landscape, request a 30-minute demo. As a lab executive, we don’t need to tell you how much the lab has changed over the last years. Every day, more and more tests are introduced, and innovation both in tests and technology is increasing at a daily rate. Innovative and start-up labs have new testing instruments and have optimized layouts and workflows of the tests. But now, labs realize more than ever that they need to advance in the way they use their LIMS and reporting tools in order to stay competitive. What will labs of the future have to innovate on in order to stay relevant – and even competitive? Cost and speed to market – In the future, labs will not only deliver test results, but will need to see historical data through intuitive reporting information and proactively report on case types, trends, and demographics in order to stay competitive and relevant. Adapting to needs – Labs will evolve to paperless and web-enabled working; in moving to a cloud-based system, innovative labs will have a chance to map out new processes to enable lab staff to focus on their most important priorities. Efficiency in the lab - Innovative labs will need complete visibility and improved communication across their workflows and processes. If they’re currently using multiple systems independently, they will need to consolidate or integrate their technology to allow for greater efficiency and communication across all technology. Customizable reporting - Lab executives will need technology that allows them to easily interpret data from existing EMRs, LIMS, billing systems, lab instruments, and middleware systems. Labs no longer serve just physicians or hospitals according to Medical Laboratory Observer; sometimes the patient is the direct customer, with the advent of and increase in specialized tests. Because of the increased demands on labs both in the types of tests they must conduct as well as the speed in which they must conduct the testing, reporting technology is now a fundamental component in any type of lab – especially those that wish to stay competitive in the future. Whether private or commercial, large or small, a single facility or part of a large, regional network, a lab’s reporting technology should be the hub for everything from patient demographics, to full historical data, lab and test trends, and overall analysis. And, this technology should be able to do rules-based and intelligent reporting based upon any number of factors across different disciplines. Looking for a partner to help your lab build out sophisticated reporting technology to meet your unique needs? Check out a 30-minute demo of Pathagility and see our reporting technology in action. You’ve probably read by now that both the House and the Senate have passed the Medicare sustainable growth rate (SGR) bill. The official name of the bill is H.R. 4302, Protecting Access to Medicare Act of 2014. The main focus of the bill delays cuts of physician reimbursements under Medicare, but a small section of the bill delays the required adoption of the ICD-10 code set industrywide until at least October 1, 2015. The President is expected to sign the bill into law. Here is a link to the entire bill (refer to section 212 for the ICD-10 delay). What does this mean for Pathagility clients/prospects? You are in a good position. Pathagility will support dual coding environments allowing you the flexibility needed to prepare for your ICD-10 transition on your specific timeline. If you haven’t already, we suggest you start discussing your conversion options and limitations with your billing provider. Based on the needs of your billing environment, the Pathagility system can support a staged adoption plan that transitions you the most efficiently allowing you to keep focus on the important work you do. The Pathagility team has been hard at work to keep up with the demands of clinician’s and labs. Improvements in speed, user experience and new features highlight the latest version of our web-based software. Our current users will not skip a beat with enhancements to our case entry screen and process. • Simplified screens- streamline data entry and eliminate scrolling and time consuming key strokes. • IntraCloud Lighting- Perhaps one of the most exciting features, is our latest technology which allows Pathagility users to migrate from one cloud to another with the speed of lightning. Whether you are a clinical, molecular, or pathology lab Pathagility can have you signing out cases in 24 hours. • Mobile lab- architectural enhancements that deliver new users access to accessioning and signing out reports with the push of a button. Clinicians can break away or augment their legacy or hospital system by leveraging Pathagility’s web-based platform. Increase revenue opportunities and freedom from rigid systems. Accession/Sign Out/ Deliver reports from anywhere to anywhere. • Custom Reports w/ Images- Pathagility’s rapid image, attachment feature and our custom report capability will set you free and distinguish your lab from the competition. Your lab is growing and the demand on your staff to print reports and fax is taking up more of their time. You don’t want to change your workflow process because everyone knows what is expected of them and they are comfortable working with your current LIS. You would like to electronically deliver reports and use a fax service but your legacy system does not have those features. Can that be added without changing our LIS? Yes. The text book answer: the ability of a system to handle a growing amount of work in a capable manner. The real world answer: the ability to store more data, handle more users, distribute more information, change as business requires, and do it all without interruption. The questions every new, or growing, pathology lab should ask when it comes to their information systems are: Will this system scale? How will this work when we add four/six/ten new doctors. How will this interface with EMR systems if we add 5/10/20 new clients this year? If your lab is in this situation, and you do not know the answers to these questions, breathe easy…we can help. All of our products and solutions have been designed from the ground up to grow with your business, and scale accordingly as your business grows. Each of our products are designed to run in a software-as-a-service environment. This is a perfect setup for small to mid-sized labs that do not want, or need, the hassle of managing their IT infrastructure. However, if a small or mid-sized lab needs to grow into a large, multi-sight lab with hundreds of customers, the same system can deployed to a large cloud bank, or inside the lab on dedicated hardware; all without interruption to your services. If you need help scaling, or have questions on the rest of our process, let us know. We will be glad to help you grow. What should pathology labs have in their sales bag? Is your pathology lab executing a growth strategy? Have you hired a sales person or team to grow your specimen count? It is critical that a modern laboratory can offer a full menu of connectivity options. Not every referring physician is looking for the same type of report delivery or consumption. Also, some connectivity options are more expensive than others, and they need to be lined up with the business drivers associated with specimen volume and physician relationship. For this reason, sales people need flexibility in this department. Some of the connectivity “must haves” are online reports, on-demand faxing, remote PDF transmission, remote printing, and EMR interfacing. Check out some previous posts on FilePath, ReportPath and EMR interfacing. These include some examples of connectivity options. The lab report provides the image of the pathology group. Generating reports that are marketable and physician friendly is critical to differentiating your practice. Here is a previous post on lab branding and marketable reports. Make sure your LIS lends itself to the development, customization and deployment of marketable reports. The ability to add efficiency to the entire lab process can help sales people open up opportunities with referring physicians as well. One example of this can be found in the ordering process. Providing an online requisition system that 1) fits into the ordering work flow of the physician office, 2) cuts down manual processes and duplicate data entry, and 3) reduces the number of calls associated with the requisition process will open some doors. If you are a lab sales person, consultant, pathologist or just someone interested in great healthcare, we would enjoy your comments. Is an interface necessary to meet the electronic results requirement? We received a call from one of our lab customers requesting a results only interface for one of their referring physicians. The referring physician has sent only a small volume of cases to the lab, and the cost from the EMR vendor alone would make the cost of an interface unjustifiable. The referring physician group was under the impression that an interface was required by the new healthcare mandates. The buzz around federal reimbursement dollars for medical practices under the ARRA (The American Recovery and Reinvestment Act of 2009) has created some confusion. Keep in mind, that a full results only EMR interface is not the only option to satisfy the electronic results requirement. Parsing fact from fiction is not easily done, and physicians are not always getting honest answers from vendors. That’s not to say that there isn’t good information available and being communicated, but many times in trying to close a sale, vendors may be muddying the waters. On more than one occasion, it has been left to us to educate not only our lab partners, but their referring physician groups on what an interface does, is, and what the costs are. If you are a referring physician, an interface (results only or results and orders interface) from the lab may be what is required, often times all that is needed is to receive results and satisfy the electronic results requirement. We provide EMR interfaces for our customers and are certainly not opposed to them. We just want to make that our customers know all the facts and we deliver exactly what they need. In the case described above Pathagility’s ReportPath product fit the bill and was just what the doctor ordered. Ask questions from your vendor, make sure you are not just getting upsold, and that you are getting exactly what you want and need for your practice. Avoid being shoe-horned into what works for someone else. At Pathagility we focus on offering products like ReportPath that work alongside and seamlessly with other systems, and strive to deliver and communicate with our partners before, during, and throughout our relationship. We’re attending USCAP 2011 – are you? In a couple of weeks, Pathagility is going to attend the USCAP 2011 Annual Meeting in San Antonio, TX. Are you? Whether you are associated with a pathology organization or you are a vendor, we would enjoy the opportunity of meeting you there. You can send us an email to info@pathagility.com or send us a DM on Twitter at www.twitter.com/pathagility.